Dr Paisley has announced his retirement, and whilst we can be tempted to reflect on his career in politics with the rose-tinted glasses of recent times, let's remember what Paisley has represented over a 40 year career in Westminster. I am proud to claim I have never voted for Ian Paisley, which is something of a statement considering my community background and the constituency I live in. I just couldn't reconcile his need to be against everything. 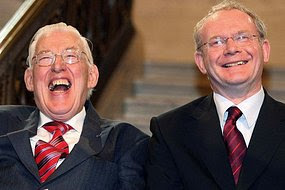 I believe history will be a harsh judge on Paisley's career, its impossible to consider that his anti-catholic, anti-nationalist oratory did not sustain and advance the cause of paramilitary republicianism. You don't have to plant bombs, or pull triggers to kill people. My maternal grandmother, was a commited Paisleyite. In her eyes no-one came close to Ian Paisley. Not quite sure she followed his policies in any great detail, more understood his commitment to not let the "free state" take over Ulster. It was that kind of rhetoric which charmed thousands of voters, time and time again and alienated as many others. In 2010, just as we start to move forward a wannabe Paisley has emerged in the form of Jim Allister, and for the first time in my life, I will be proudly marking an X beside the name of a Paisley in this constituency, quite simply because a vote for anyone else, would be to help Allister get one step closer to being our MP. Paisley in quotes from The Guardian.